Dhani Harrison is set to join Jeff Lynne's ELO on their 2019 North American tour. Harrison will open all dates, from their first show on June 20th to their last performance on August 1st. The tour will travel across North America, visiting cities such as Nashville, Atlanta, Washington, Philadelphia, Newark, Chicago and more. Tickets for the upcoming tour can be found here. 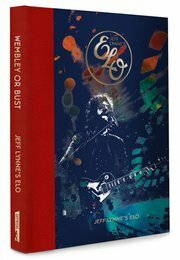 Jeff Lynne's ELO and their iconic 2017 Wembley performance is captured in the Genesis edition, Wembley Or Bust. Offering an insight into Jeff Lynne's musical vision and reflecting on a whole host of ELO classics such as, 'Mr. Blue Sky' and 'Livin' Thing', this limited edition documents a historic homecoming that is out of this world.